Being that I come from an Italian family, Saint Francis of Assisi was on the lips of my grandparents and I remember hearing his name as a child. As a teenager growing up at my parish here in Scottsdale, one of the saints many people spoke about often was Saint Francis. Many Catholics, including many non-Catholics, know the life and story of St. Francis of Assisi. But what most people don’t know is that Francis is more than just the “animal” saint. Yes, he loved nature and found it to be like his “brother”, but there is more to St. Francis than just this aspect. 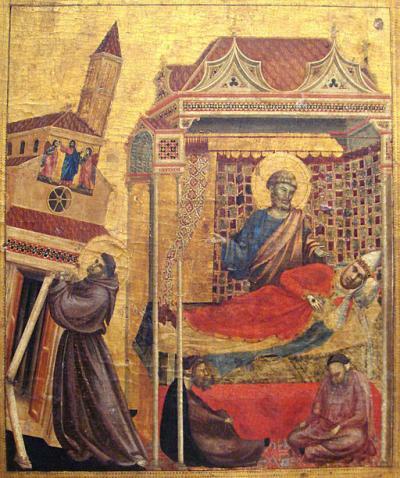 Francis was charged by Christ to rebuild his Church. It wasn’t to be just a literal build, but he was to rebuild the inner workings of the Catholic Church. That’s the St. Francis people must come to know and love, not just the saint “with the birds.” He is one of my most popular saints the Church has in her Mystical Body. His life in the Church is a blessing and after nearly 800 years, the Franciscan Order, which he founded, still continues to grow and flourish. The Legacy of Saint Francis of Assisi lies with the orders listed below. In the past seven years, I have encountered some of the most amazing men and women in my life, and yes, they wear the Franciscan habit. The blessings I received by attending Franciscan University of Steubenville for two years was enough to last a lifetime. Being in the presence and studying under the friars of the Third Order Regular is something I will cherish till I reach the other side of Heaven. The Franciscan Orders below are by no means a comprehensive list of the many communities that exist, however, these are some of the ones that have touched my heart and heart of others I know. Please take the time to review each one and pray for the work they do. This blog post is dedicated to Rev. Michael Scanlan, Rev. Terence Henry, Rev. Daniel Pattee, members of the Third Order Regular from Loretto, Pennslyvania and to the Poor Clares of Perpetual Adoration in Tonapah, Arizona. Your witness to the life of Christ through the habit of St. Francis is a blessing to all who encounter you each day. St. Francis of Assisi…Pray for Us!